Renn, the most awesome Jedi ever, son of my writing friend Bethany Telles, is about to undergo a 72-hour Video EEG to try to find out what is going on with the seizures he’s been having for several months now. You can read more at Bethany’s blog, Perched in a Tree. Please keep Renn and his family in your thoughts. 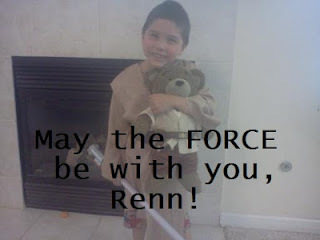 I just read about Renn on Ms. Telles’ blog. I sent some Super-Force healing his way.